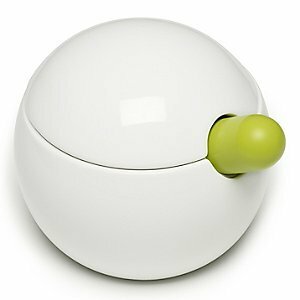 This stylish mortar and pestle may not match the oomph of Julia Child’s but it does look pretty fab. It’s designed by Joseph Joseph and made out of non-absorbent porcelain. While this looks like a beautiful brass object, it’s actually used for a fairly gruesome purpose. It’s used to press a duck or lobster carcass to create gourmet French dishes. WiseGeek has a good description of how this is used. A duck press, incidentally, is usually made of brass or another heavy-weight metal. It stands about 20 inches (51 centimeters) tall and weighs somewhere around 25 pounds (11.3 kilograms). The press has a heavy disc attached to a turning screw, which ratchets the disc down into a container. The truly macabre ones stand on brass webbed duck feet. After the duck carcass is placed inside the duck press, the waiter screws the metal disc down, down, down, pressing the carcass flat, in order to extract all the remaining juices and marrow. When this gruesome task has been accomplished, the waiter adds those juices to the wine reduction, along with a little brandy or cognac, and some butter. The resulting sauce and duck breast slices are then presented to the diner, along with the duck legs, with perhaps a shaving or two of truffle. A man named Mechenet introduced the recipe in Paris in the early 1800s. It was a hit. Chef Frèdèric of the restaurant La Tour d’ Argent copied the recipe and even went so far as to number the pressed ducks served in his restaurant, since it was the establishment’s signature dish. Over 1 million pressed ducks have been served at La Tour d’Argent, which is still open. FXCuisine has an illustrated guide to duck press usage at La Tour d’Argent: Duck Tour d’Argent. Another good description comes from Cooking Issues: Pressed Duck: A Photo Diary. This wonderful recipe was created at the beginning of the 19th century by a restaurateur from Rouen named Mèchenet. This recipe for pressed duck owed much of its success to the Duke of Chartres, who commended it highly in Paris. When the renowned cook Frèdèric took over the restaurant La Tour d’ Argent, he began numbering all the pressed ducks that he served, intending to make the dish the specialty of his restaurant. By the end of 1996, a million had been served; #328 was served to Edward Vll, the Prince of Wales. In 1890, #33,642 was provided for Theodore Roosevelt and #253,652 for Charlie Chaplin. special screw press. The juice obtained is flavoured with Cognac, thickened with butter and poured over the aiguillettes, (the slices of breast) which finish cooking in the sauce. 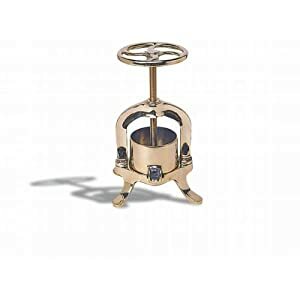 You could fly to Paris to enjoy this meal for around 100 euros or you could buy this lovely press on Amazon for about $2,200. That’s a discount of over $1,200! That’s a bargain compared to the cost of flying and hotel. 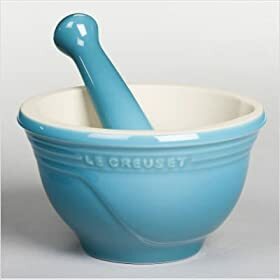 I swear I heard gasps of envy when Julia Child receives her mortar and pestle in the movie Julie and Julia. The theater was full of jealous and hungry foodies. 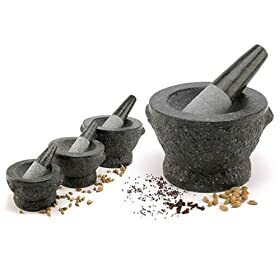 Nothing grabbed their envy gland more than that big stone mortar and pestle. It just screamed spicy goodness. You may not be able to get Julia’s mortar but you can find some other useful varieties. Le Creuset will help you channel your inner French chef. features a polished inner surface and pestle to avoid absorbing flavors. Is there anything Julia could not do in the kitchen? This video was featured in the Smithsonian‘s National Air and Space Museum’s Life in the Universe gallery.